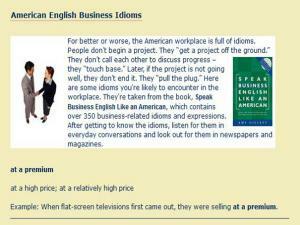 Discover American idioms and their meaning with Voice of America's Interactive Idiom Dictionary. 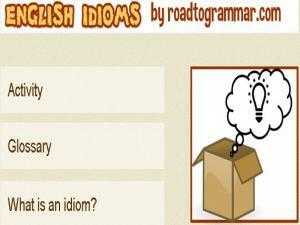 Each idiom has a definition, usage and example dialogue so you can hear the phrase in context. 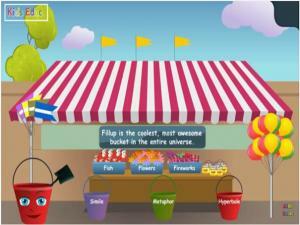 This is a simple game to help you hear the differences and similarities with words. Look at the picture. Say what it is. Read the 3 choices and click on the word that you think rhymes with the picture. In this lesson you will learn 10 very common English expressions used in everyday conversation. Practice trying to use them when you’re speaking (not too much!) and take the quiz to test your understanding. The idioms include phrases like "sleep on it" and "to be broke." 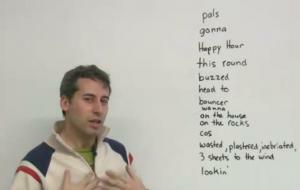 Easy-to-use alphabetical list of English slang terms. Remember that most slang terms vary by geographic location. 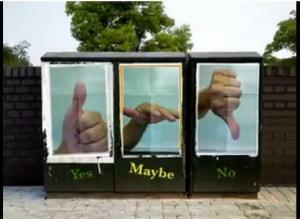 This video shows examples of how to say "yes," "maybe," and "no" in a variety of ways. These phrases are very useful for when you want to politely accept or decline an offer. 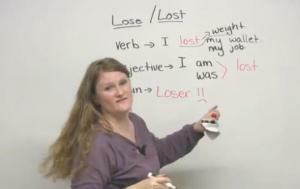 Learn all about how to use the word 'LOST' in English! Sometimes it's good to lose, sometimes it's bad and sometimes it's an insult! 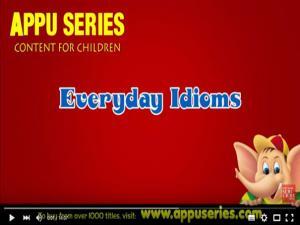 This animation teaches you how to tell the difference between idioms and proverbs, identify the use of phrases, adverbial phrases, adjective phrases, noun phrases and verb idioms as idiomatic phrases. It also teaches you some commonly used proverbs.There are lots of examples and clear illustrations to help you understand and remember. Learn about similes, metaphors and hyperboles by listening to the lesson and watching the examples. Once you think you have understood the differences, try the practical activities by sorting the sentences into the correct buckets. This site has 11 great animations that really help to show you what an idiom means and how it can be used in everyday life. 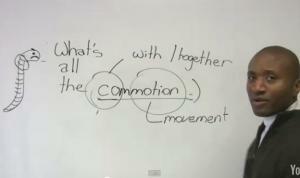 Start the video to see what each idiom is, and then watch to see what it really means! Which picture matches the meaning of the simile? Read the sentence and make your choice. 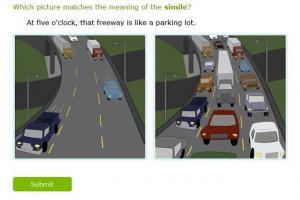 Click on Submit to see if you are right! 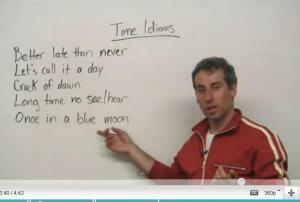 In this English class, I discuss a few common expressions that you can use to talk about time. 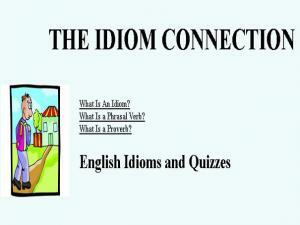 I show you the context and how to use the idioms. Learn how to use some common English idioms and expressions in everyday life. In this intermediate English lesson you will see two people a a gym talking about their fitness routines and some unusual sports. They use some common expressions during their conversation. 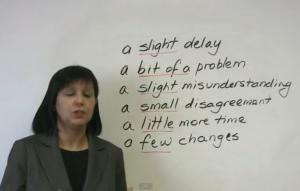 Video class about common idioms for expressing good and bad news with interactive oral exercises. 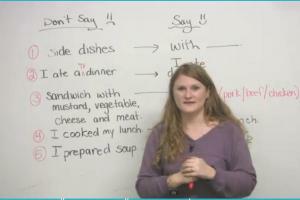 After watching the video and reviewing the included grammar notes you can complete the printable and online exercises! You can even check your answers. 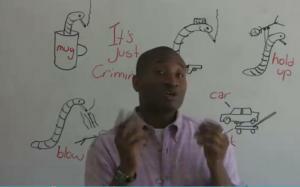 In this English lesson, you'll learn words and idioms to talk about CRIME. You'll need to know these words and idioms to understand a lot of TV shows and movies, but they might be important to you in real life, too! 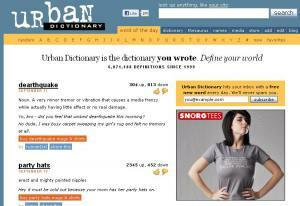 This is a funny site that includes only slang words, sometimes very dirty ones! These are all added by users, so not all entries are truly correct or popular. Everyone loves food! There are so many expressions and idioms in English that involve food, and in this lesson you'll learn some of them! 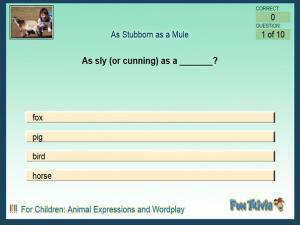 This is a fun game to test your English animal idioms. Read the sentence; there's a Chinese Zodiac animal name missing from each one. 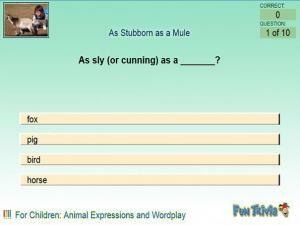 Drag the correct animal to the answer box to complete the idiom. 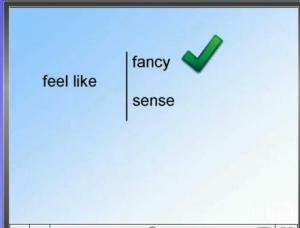 If you are correct, it will stick, make a noise and show you complete sentence and the idiom's definition. In this English lesson you will learn several idioms that have to do with hair: let one's hair down, hair's breadth, hair trigger, split hairs, hare-brained, and hair of the dog that bit him. 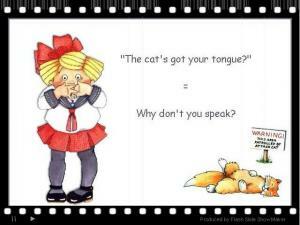 Idioms are fun and make your English sound more natural. What is the difference between "cooked," "prepared" and "made"? Correct your English with these 5 tips about common mistakes people make when talking about food. In this business English lesson you will learn some very common expressions that you might hear in the workplace. If you don't learn these common phrases you might find it hard to understand your English-speaking coworkers! By following a few simple techniques, you can make any problem sound less serious. Learn how to resolve your difficulties more easily, in business and in life. This English lesson will show you how. This list of idioms (in alphabetical order) is quite large and accurate. These are great words to use in conversation! Have you every heard VERY LOUD construction work on the street outside your window? How annoying! Learn some idioms and vocabulary to talk about LOUD NOISE in English (ruckus, racket, commotion, squabble, bru-ha-ha, etc.) There's a quiz at the end of the video so you can test how much you learned. A story about New Year's Eve, full of slang, vocabulary, and expressions related to drinking, partying, clubs, bars, and other typical North American New Year's Eve activities. After you've watched the class, take the free quiz to test your understanding. Test your understanding of English expressions by reading the idiom and then drawing a line to the correct matching definition in the other column. 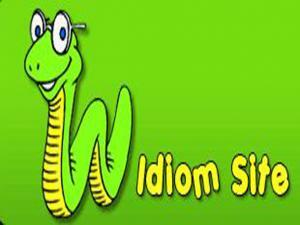 This is a good slide show that goes through some common idioms and explains what they mean. Read the phrase, then read the real meaning. The picture also helps you understand what the idiom is about. How many do you know? 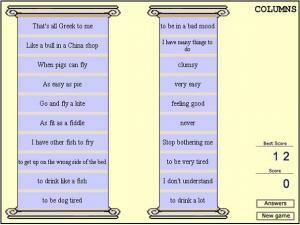 This site goes through lots of common expressions and idioms that you may have heard used in English. 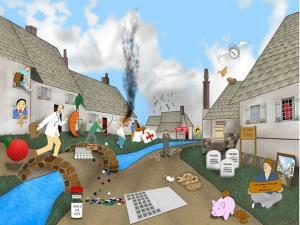 There are fun illustrations to accompany the idioms and the explanation of the true meaning behind the phrase. Read the phrase first and see if you already know what it means. This site gives a clear, simple explanation of what an idiom is, as well as an A-Z Glossary listing lots of examples and their meanings. You can either go through the glossary and learn new phrases, or you can take the Activity Quiz and see how many you know already! There are 10 well-known slang phrases in this game. Try and work out their real meaning and click on A,B,C, or D. How many can you get right in the time? This teacher is crazy! 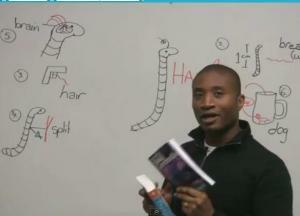 Learn new idioms each week in this fun video series. A transcript of each video is available, too! Idioms and slang are difficult to remember, but this video focuses only on idioms that use the word "mouth." What is a motormouth? What does it mean when you shoot off your mouth? Learn these idioms in a fast and fun class. Can you win the Hungry Hangman Game? Each puzzle is a famous proverb. Look at the puzzle and guess the letters. If you guess correctly, you will move closer to the vegetarian cornucopia. 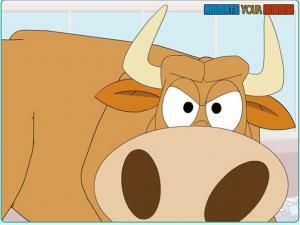 If you guess incorrectly, your farm animal opponents will move closer. See how many different proverbs you can uncover. This is a fun quiz about animal analogies! Choose an animal to complete each saying. There is a full explanation of the answer (whether you are right or wrong!) after each question so you can really understand the phrase and the meaning behind each animal. 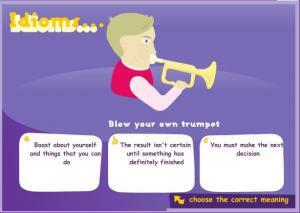 A great site to test you understanding and knowledge of the main idioms and phrases in English. Read the idiom and then read the 3 possible answers. Choose the one you think gives the correct explanation of the phrase. Don't worry if you get it wrong. You will be shown the right answer. At the end you can see how many you got right! Do you know where the word sandwich comes from? Why are some apples called Granny Smith? 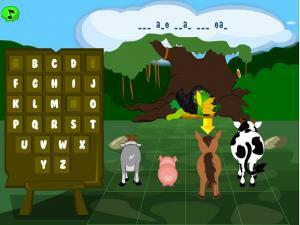 This game is interesting and a little bit different to just learning new grammar or vocabulary. You learn about English eponyms, words that have borrowed their name from an actual person! 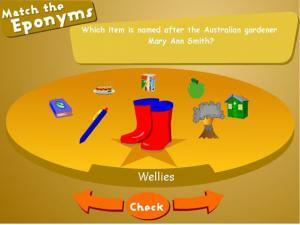 Read the question, then spin the carousel with the arrows to match the correct answer to the right eponym. Idioms are the most refined expressions in any language. It requires a good deal of practice and exposure to incorporate them into your everyday conversations.Watch this animated video to see some examples of 'Everyday Idioms'. All of these phrases are worked into some fun contexts! 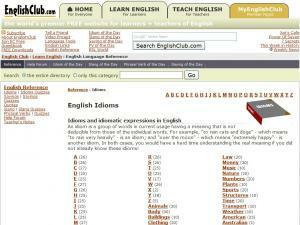 You can find the idioms in both A-Z order and index of topics. Clear format and easy to understand. 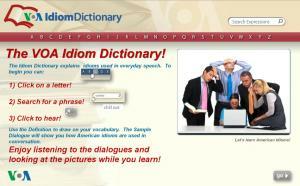 There is "Idiom of the Day" and you can learn an idiom daily without any search! Choose an animal to complete each saying. There is a full explanation for each answer. 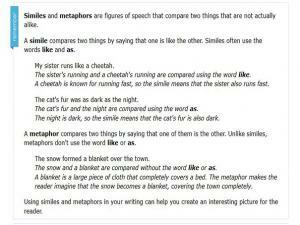 Similes and metaphors are figures of speech that compare two things that are not actually alike. Take this quiz to see if you understand the difference. Read the two sentences and pick the correct similie or metaphor. If it wasn't for the weather, the English would have nothing to talk about! 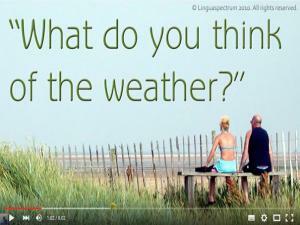 This video looks as general weather words and expressions used in English. Expressions like "Red sky at night..." "Red sky in the morning..." "Nice weather for ducks!" "Turned out nice again." 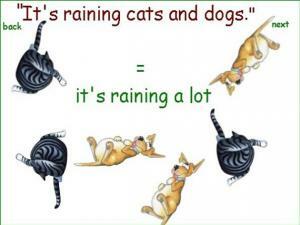 "Raining cats and dogs." and more. Click on the different parts of the picture to be shown a popular adage or idiom in English. You will be given more information as to the explanation and background of each phrase. 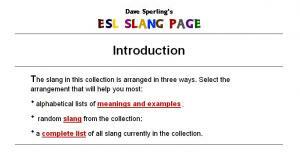 Slang is very informal language which is often used by young people. It's hard to keep up to date with slang, but this article will help you learn a few words that your teacher may not know! At the end, check your understanding by answering the questions. 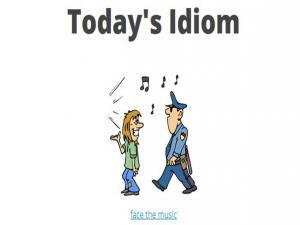 A great site that features a daily idiom. Listen to the pronunciation and definition. Then read through and listen to some different scenarios where you can see how the idiom can be used in everyday speech, and go through the sentences to see how it can be used in everyday language. There is a full index of all the idioms on the site. This site lists lots of business idioms you are likely to encounter in the workplace. After getting to know the idioms, you can listen for them in everyday conversations and look out for them in newspapers and magazines. 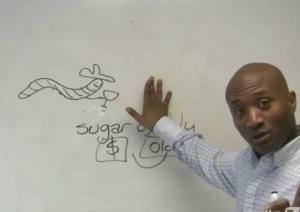 Learn some very common English expressions about money — especially how to talk about having it and not having it! The expressions covered in the lesson are: loaded, make a killing, making ends meet, hand to mouth, an arm and a leg, pinch pennies, put in your two cents. Don’t forget to take the quiz below to test yourself after you’ve watched the lesson. 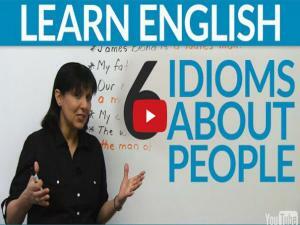 Watch this lesson on 6 Idioms about People. Are you a ladies' man? A woman of your word? A man of the people? Learn the meanings of these English idioms and find out which ones you can use to describe women too! An interjection is one of the eight major parts of speech, along with verbs, nouns, pronouns, adjectives, adverbs, prepositions and conjunctions. 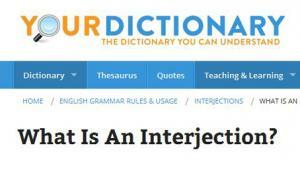 This site goes through the different types of interjection and shows how to use in different places within a sentence. How well do you know popular English proverbs? Do this quiz to find out. 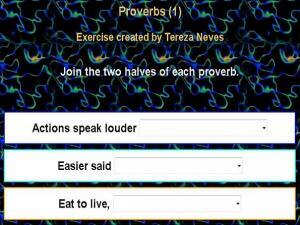 You need to join the two halves of the each proverb by reading the first half, then selecting the matching half from the drop down box. You can check your scores at the end to see how many you got right. If you think you know more, there are 2 more exercises to try after this one! 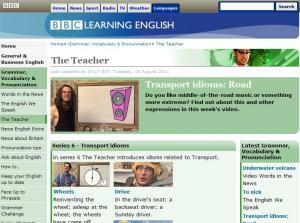 This is a great, comprehensive site all about Idioms in English. 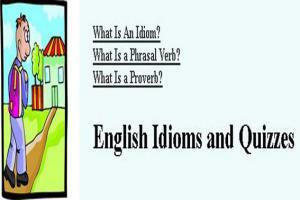 There is a full explanation at the beginning about the differences between idioms, phrasal verbs and proverbs. There is then a full A-Z list of idioms, as well as a list under subject headings. There is a quiz to test your understanding at the end of each section. There are so many idioms on this site, you will be sure to know as many as any native-English speaker! 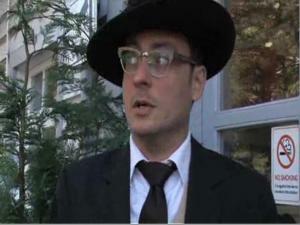 Watch this video from the BBC and join the teacher as he visits the most haunted village in Britain! He explains lots of idioms and phrases connected with fear in English. Do you know any of them already? Use the check at the end to test your new knowledge. 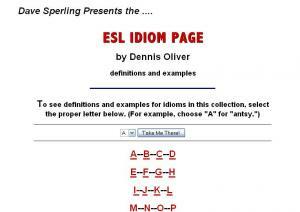 This page is constantly updated with a new lesson on English slang for advanced learners. There is a list of past lessons that you can access if you want even more practice. 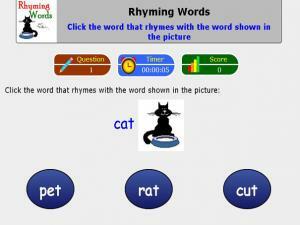 All lessons are clearly marked by topic so you can easily find the phrases you're looking for. This fun site starts with an explanation for the difference between Idioms, phrasal verbs and proverbs. It then has a full list of A-Z idioms, as well as some topic categories, and a list of common idioms. Each entry is explained and there is an example of its use in a full sentence. 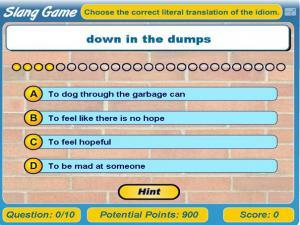 At the end of each section there is quiz to test your understanding and new knowledge of idioms! An A-Z list of all the most well-known idioms and phrases in English. Go straight to the idiom you want by clicking on the letter or read through the whole list. There is an explanation for each idiom underneath. 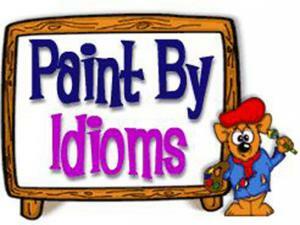 Idioms add color to language. Help FunBrain.com's grand master, Salvabear Dali, finish his paintings by identifying the correct expression. First choose a theme and a difficulty level. Then choose a game options. You have 4 to choose from. You can also decide which character you would like 'to paint'. Don't worry if you get any wrong. The correct answer will be given with an explanation. Get them all right and have the option to move up a level!